In Greek mythology, the chimera was a fire-breathing female monster resembling a lion in the forepart, a goat in the middle and a dragon in the hind. According to legend, she was a daughter of Typhaon and Echidna, and had three heads, one for each of the three animals of which she was composed. In this drawing, the dragon at the rear emits what appear to be tongues of flame. The chimera caused havoc in Lycia and surrounding countries, and was finally killed by Bellerophon, who accomplished this feat by riding on the winged horse Pegasus and firing his arrows at the monster from above. Jacopo Ligozzi -painter, miniaturist, naturalist and scientific draughtsman (to name only some of his accomplishments)- is one of the most talented of the many artists active at the Medici court in the years around 1600. He came from a family of painters and craftsmen active in Verona over several generations. At the invitation of Francesco I de Medici, Ligozzi arrived in Florence in c.1577, working there primarily as a designer of tapestries, objets and furniture. He later participated, along with many other artists, in the ephemeral decorations erected in 1589 at the Palazzo Vecchio to celebrate the entry into Florence of Ferdinand I and Maria Christina of Lorraine. As Ligozzi’s career developed, he became increasingly active as a painter of altarpieces and frescoes in and around Florence. Ligozzi, unlike most of his contemporaries, was fascinated by the style of Northern painting and drawing disseminated in Italy through engravings. He greatly admired its meticulous finish, and this influence is apparent in his miniatures and many drawings of natural history subjects commissioned mainly for the Medici, a good number of which are preserved to this day in the Gabinetto Disegni e Stampe of the Uffizi. Ligozzi’s experience as a draughtsman of natural history subjects and his passion for minute description of detail is seen in this drawing in the scrupulous rendering of the lion’s mane; in the webbed claws of the dragon and its hybrid wing of membrane and feathers; and in the disconcerting, penetrating look in the creature’s eyes, given added life by touches of gold. 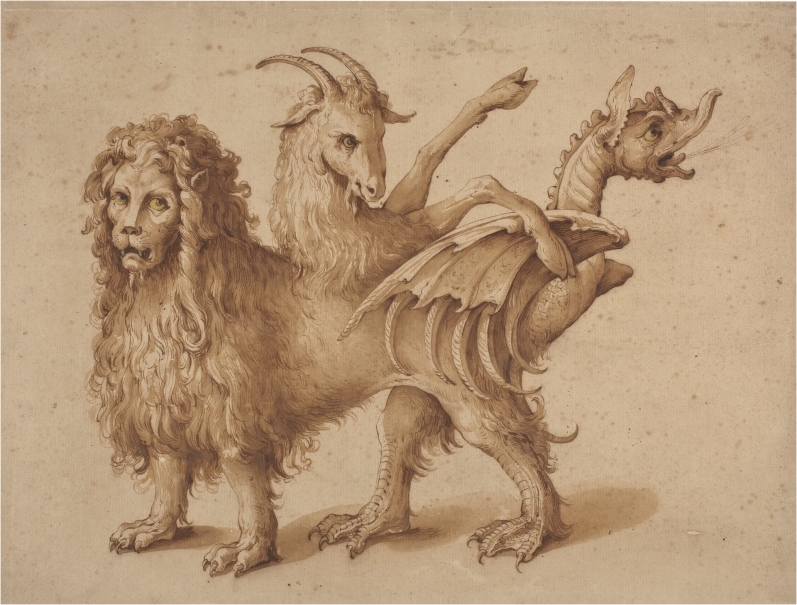 A chimera (La chimera), 1590-1610, one of the few Italian drawings belonging to the Prado with a provenance from the Spanish Royal Collection, was placed as anonymous, Italian, from the sixteenth century. 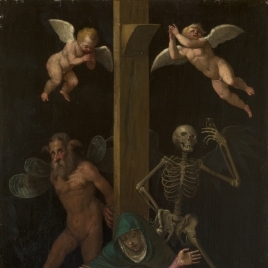 Its present attribution to Ligozzi has received widespread support. The drawing’s purpose is unknown - either it was made as a drawing in its own right, as a curiosity, as its meticulous finish would suggest, or perhaps it was to be engraved, although no such print has been identified (Text drawn from Turner, N.: Italian Masterpieces. From Spain´s Royal Court, Museo del Prado, 2014, p. 64). Height: 323 mm. ; Width: 424 mm.